If you are logged in to the L'application mobile Virtual Office on your device, your device displays a notification to notify you of a meeting invitation in Virtual Office. In the L'application mobile Virtual Office, you can join a meeting through SMS and IM, My Meetings, or Join Meeting. Tap the conversation containing an IM invite to a Conférence Virtual Office. In the IM invite, tap Start Meeting or Join to launch the meeting. In the list, scroll to the meeting you want to join, and tap Start Meeting or Join next to it. The Conférence Virtual Office launches. For details on the meeting controls, refer to Tour the Meeting Interface. From the main menu, select Join Meeting. At the prompt, enter the meeting ID that has been given to you by a participant of that meeting. You can join a Conférence Virtual Office through the Google Calendar app, directly or via notification, or through your email inbox. You can join a Conférence Virtual Office on your mobile device using the Google Calendar mobile app. If you are invited to a Conférence Virtual Office via email, you can view and join the meeting through Google Calendar. Log in to your Google Calendar mobile app. Tap the desired meeting in the list. In the meeting description, tap the link. The Conférence Virtual Office launches in the L'application mobile Virtual Office. You can also set a notification to remind you of the meeting ahead of time. In the meeting description, tap the reminder to edit it. In Edit Event, tap Add another notification to add a reminder. In the permissions for Google Calendar in your device settings, make sure that Allow Notifications is switched on. When you receive the meeting notification on your device, swipe the alert to open Google Calendar. In the meeting description that opens in Google Calendar, tap the meeting link to join the Conférence Virtual Office. If you are invited to a Conférence Virtual Office via email, you can view and join the meeting through the invitation in your email inbox. Open the Conférences Virtual Office invitation in your email inbox. The invitation contains a prompt to confirm your availability, the URL and dial-in phone numbers that have been assigned to the meeting, and the option to join from an in-room video conferencing system. Using the given information, join the meeting. If you click the URL, the Conférences Virtual Office landing page opens. 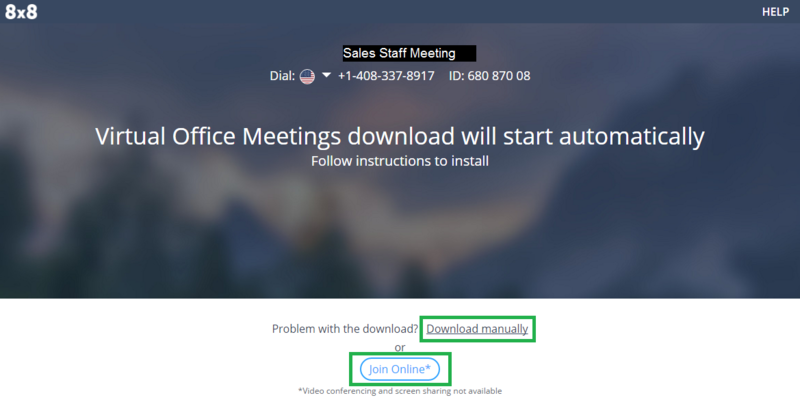 The meeting automatically opens in the L'application de bureau Virtual Office, or downloads the app for participants without Virtual Office. If the app does not download automatically, click Download manually. If you already have the application installed but see no prompt to launch the meeting, click Try Again. If you want to join the meeting online without downloading the app, click Join Online. If you choose to dial into the meeting, you can use any softphone or hard phone to dial in. Once you join the meeting, you can join meeting audio to hear and speak with other participants. To switch between your available audio channels at any time, tap during the meeting.